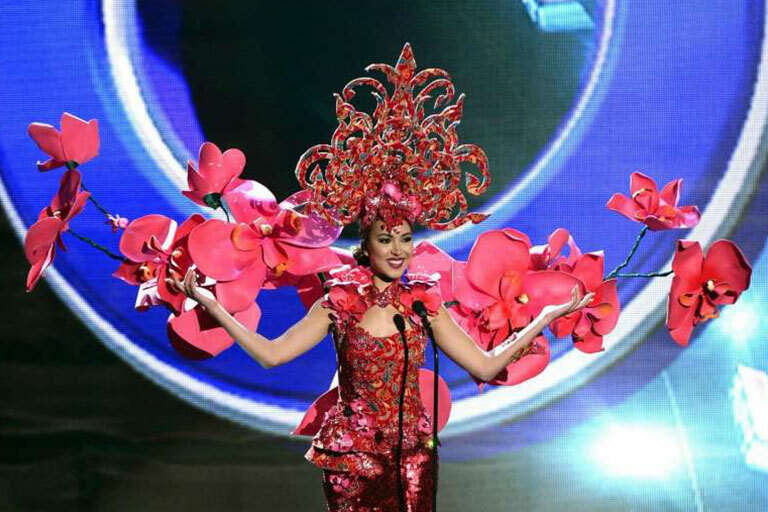 Call in the fashion police because this year’s Miss Universe Singapore National Costume is a fashion no-no. Throughout the years we’ve seen a ton of crazy (and whacky) costumes that were donned down the runway. However, this year’s costume is certainly impermissible. I mean, we admire the message that’s being conveyed behind the design but, are you for real though? If you haven’t already figured out, the “iconic” dress, had already made headlines for its design inspired by the Trump-Kim Summit that was held earlier this year in June 2018. The event was the first ever meet up between North Korea’s Mr Kim Jong Un and US President Mr Donald Trump – marking it as one of the most monumental moments in history to date, domestically and internationally. The “mastermind” behind the controversial national costume is none other than, Mr Moe Kasim, himself. It was his third year designing the MUS national costume and this year’s costume took three months to make. We totally admire the blood, sweat and tears put into this costume but we weren’t expecting something this clichè! 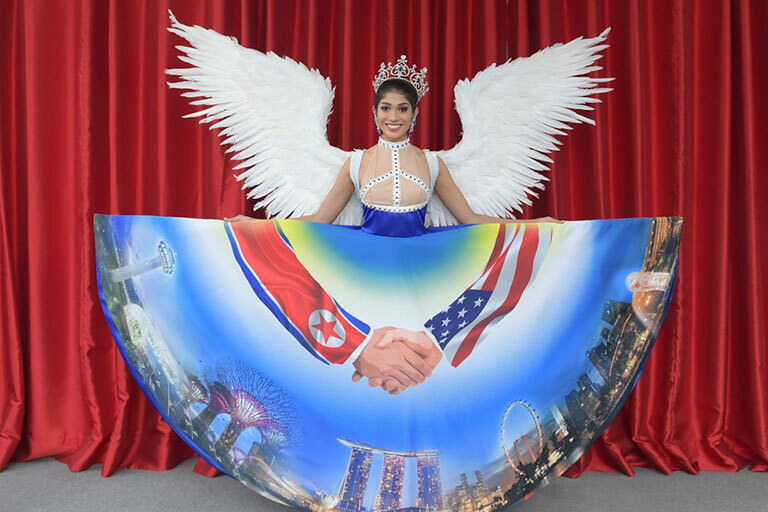 Yes, we get how the dress is supposed to represent world peace but if it comes with dove wings, a peace symbol and a blue silk skirt emblazoned with a handshake representing the two countries? All we have to say is, peace out! Is that an angel? Is that a plane? No, honey, that’s Miss Universe Singapore, Zahra Khanum in this year’s national costume. Now, this dress may be a little over the top with the wings but girl, if you think it stops there, think again. Lo and behold! The dress that everyone has been talking about. 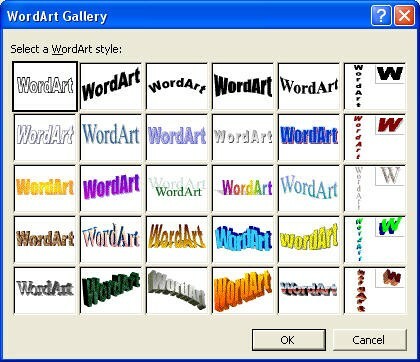 If this doesn’t remind you of your old WordArt days, we don’t know what does. If you haven’t gotten enough laughs, here’s a look at the previous MUS costumes over the past 10 years and their inspiration behind each and every costume. Have you seen the beautifully lit Supertrees at Gardens By the Bay? If you have yet to, then here’s a close-up! A headdress that weighs 1kg, alongside a 3kg backpiece? If there’s one thing we truly admire about Cheryl Chou’s reign as Miss Universe Singapore in 2016, it’d probably be about her strength. Having to carry 500 Swarovski crystals on her head for hours on end? Damn, does this girl lift! Would it be too much to ask for something a little more normal? This is what we’re talking about! The stars and crescent may be a little too over the top but this outfit is by far one of the most stunning numbers out of the lot that’s worth praising. We’re guessing the dress was inspired by a peacock in a garden of orchids? The image may not be in high-def but we definitely don’t have to ask for much because we can already tell how much of a mess this was (even in LQ). It’s a dress and a carpet! What more could you ask for from this multi-functional piece? “Every cloud has a silver lining.” And thankfully, for this dress, it was one of them… until designers took centre stage with more whimsical outfits in the years that came after. We’re cringing so hard it hurts. Nothing screams Singapore more than being dressed like a Merlion itself. The annual Miss Universe competition will be held in Bangkok on December 17th at Impact Arena. So mark your calendars, because like many, we’re at the edge of our seats and we’re just as curious to find out what the world has to say about our country’s own national costume. Godspeed!